It’s no secret that kid’s films have gotten smarter. Sure they still contain all the elements that make a child happy and keep them entertained, but now they also cater more to the adults who are taking the kids to see the film. With sneaky pop culture references and sly innuendo, adults are getting more and more enjoyment out of certain films- a win for studio execs who want to increase their audience viewing numbers and movie fan bases. Similarly, kid’s books are also getting an upgrade- making them more enjoyable to read for children and adults alike. 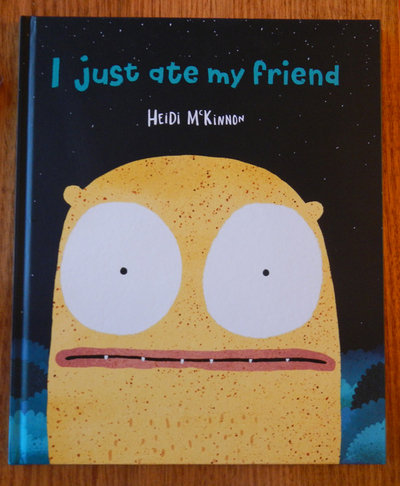 It could be the unique storyline, the unusual monster illustrations or the expressions on said monster’s faces, but Heidi McKinnon’s I Just Ate My Friend is one such book. The premise is simple- our protagonist is a big-eyed yellow monster who made the terrible mistake of eating his only friend. Even though he was a good friend, he is now gone, so our yellow monster heads out in search of someone new. But everyone he meets rejects him as either too big, too small, too scary or too slow. Some just outright reject him, giving no reason at all, while others are too frightening to even ask. Will our yellow monster ever find a new friend? This is a fantastic book about the search for friendship and belonging, and if you’re anything like me, the twisted ending will actually make you laugh out loud. In fact, I asked several other adults to read this book and got the same laughing response each time- surely a sign that this book is more than suitable for both children and adults. This picture story book not only covers the field of friendship, it also teaches a little bit about the importance of impulse control- something our yellow monster is probably wishing he had practiced before eating his only friend! I love clever children’s books like this. They feature meaningful yet funny storylines, and make story-time enjoyable for all involved.